Recently, MERS has been called “a threat to the entire world” by the director of the World Health Organization. The virus, which had previously been found only in Saudi Arabia, has recently made the jump to South Korea, triggering the largest-ever outbreak outside the Middle East. MERS, which stands for Middle East Respiratory Syndrome isn’t supposed to spread easily among humans, but new studies might prove different. MERS was first discovered in a patient who died in June 2012 in Jeddah, Saudi Arabia. International travel has now spread the MERS to China, South Korea, Mayalsia and Thailand for the first time. Although, cases in there Asian countries is small, many countries in the region are starting to take precautionary measures in response to the virus spreading. Until then, MERS has largely remained in Saudi Arabia. 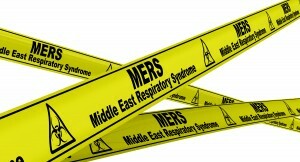 MERS is thought to reside in bats and camels, but on rare occisions sickening humans who are suceptable to infection. This might be changing, as the South Korean situation might mean the virus is mutating, as all virus do. The problem might be if the MERS becomes airborne which means it will be easily spread between humans. In the past, when MERS has made the leap to human populations, the disease hasn’t gotten very far. In South Korea, 166 people have been infected, 24 have died, and thousands have been under quarantine or observation. 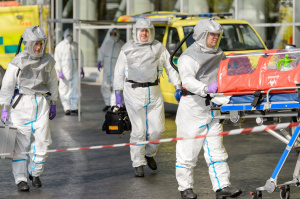 As of June 2015, the number of cases seemed to be slowing, but the World Health Organiation has warned that “outbreaks are unpredictable, and could happened anywhere”. Historically, MERS hasn’t spread far beyond hospitals and the households of those who have been infected with MERS. In one study which tracked 26 MERS patients and found they only gave the virus to 4 percent of their household contacts. The infection rate in hospitals can be much higher since the virus can spread more easily. Experts on the virus believe it takes prolonged exposure to MERS to sicken people, and poor ventilation and spatial separation in hospital rooms can expose patients to large amounts of the virus which create the perfect environment to infect a patient. The disease seems to disproportionately strike the kinds of people who stay in hospitals: elderly folks or those who are already weakened by other conditions, such as diabetes or underlying respiratory problems (though some younger folks have fallen ill from MERS, too). But as it turns out, there’s a lot we still don’t know about MERS. It was only discovered in 2012, and the countries that previously harbored the virus, like Saudi Arabia, haven’t always been transparent about their findings. Experts still don’t understand exactly how MERS is transmitted, which is worrisome. And the fact that the disease is a deadly respiratory infection, from the same family as SARS (which infected more than 8,000 people during a 2003 global pandemic), has health officials on guard. Several countries in the region have taken precautionary measures in response to the outbreak. Malaysia has warned its citizens to avoid South Korea while Hong Kong issued a red alert against non-essential travel on Tuesday. The MERS virus, which first emerged in Saudi Arabia and has since spread throughout the Arabian Peninsula, the U.S., Europe and Southeast Asia, may be airborne, according to a paper published Tuesday. Researchers found an air sample containing fragments of MERS, or Middle East Respiratory Syndrome Coronavirus, at a barn that had sheltered an infected camel and a MERS patient. An air sample collected on the day that one of the camels was confirmed to have the illness came back positive for the virus. “The detection of MERS-CoV RNA in the air sample from this barn concurrently with its detection and isolation from the infected camel and the onset of symptoms in the patient warrants further investigations for the possible airborne transmission of MERS-CoV,” said the study. “It’s another clue of a role for camels and it’s another indication that this is an airborne virus,” said Laurie Garrett, senior fellow for Global Health at the Council on Foreign Relations. King Abdulaziz University in Jeddah, Saudi Arabia supported the study.